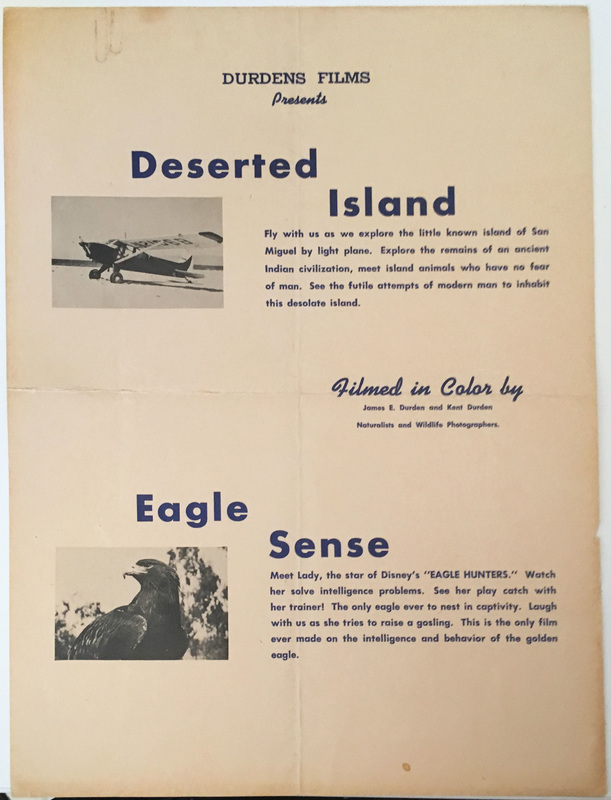 This is an early flyer for a couple of nature films Kent and Ed had created together. They never did much else under the name Durden Films that I have seen. This must have been around 1956. "Eagle Hunters" was a 2-part special that was on The Mickey Mouse Club that year and Kent was one of the actors in it. By 1958 Lady had been in the Academy Award winning short film "Grand Canyon" by Disney (you can see the whole thing, including Lady near the end here), which is not mentioned on this flyer. Ed spent a lot of time on San Miguel island and all of the Channel Islands off the coast of Santa Barbara. I have yet to find the "Deserted Island" film in Kent's stuff. I don't know if it survived. I'm sure most of the "Eagle Sense" footage was used in the Gifts of an Eagle film.